It turns out Carmelo Anthony is not as dumb and greedy as we were led to believe. No, he’s not going to the New Jersey Nets in a trade, which Nets owner and oligarch (I love covering oligarchs) Mikhail Prokhorov announced Wednesday after arriving back in the U.S. Prokhorov said that the trade talks had become a distraction–apparently denying the Nets a chance for 12 wins and to really create space between themselves and the Cavs for last in the East–and the Nets no longer would pursue Anthony. I’ve been in situations like this before, usually when a girl I was dating called to break up and I said the line was busy but I was calling to break up with her. So with that news came a flood of e-mails instructing me to advise the Bulls to try to trade for Anthony. Especially with reports from sources who may or may not know that Anthony’s “people” are pushing for him to go to the Bulls now. OK, the Bulls will take him. But why now all of a sudden? You mean Anthony wanted to go to the Nets, to play in Newark, all this time and why we’d heard nothing about the Bulls was because he liked the idea of going to the Nets? C’mon, how ridiculous is that? The truth is Anthony was never going to the Nets. Sure, the Nuggets wanted to trade him there, and sure the Nets wanted him. And sure the Nuggets could have traded him, and sure the Nets could have taken him… and then seen him leave as a free agent this summer and go to the Knicks. The complication in it all, and it remains one, is the new collective bargaining agreement. Anthony has a three-year extension waiting at about $22 million a season. The conventional wisdom is if he waits until a new deal is signed, he risks a new salary ceiling and perhaps having to accept a deal at maybe up to $10 million less per season. Although no one knows yet what the new deal will be. So that’s all speculation for now, though everyone seems to believe Anthony would make less waiting it out and, say, signing with the Knicks as a free agent. He does want it all–the Knicks and the money–sort of your black and white cookie and to eat it as well. And if you want to go somewhere in what may be your last major deal of your career, why not go where you want to go? The Bulls, by the way, remain interested in Anthony and have been all season. They have been in contact with the Nuggets and Anthony’s representatives regularly. They have mostly been told not to bother, though you never know. But as we know it’s never over until it’s over. So why not keep trying? I’ve heard the Bulls did sign up for one of those mobile phone unlimited call and text deals. Sweet. Call the Nuggets and agent Leon Rose as much as you want and it doesn’t cost extra. From what I have heard from my sources who may or may not know, certainly every bit as good as theirs, is Anthony only wants to play for the Knicks. I have often written if he wants to win his best chance is playing with a Bulls team that includes Derrick Rose, Joakim Noah and Carlos Boozer. So how come we don’t hear that much if it’s so obvious? It seemed obvious for LeBron James as well, represented by the same agency and the same so called power brokers like, and James didn’t seem all that interested, either, and basically did what he felt like. Would James be better off with Wade, Bosh, Z and Arroyo or Rose, Noah, Boozer and Taj? Seems obvious to us, though our beaches aren’t open quite yet. But neither are New York’s. For whatever personal reason, and I do hear it’s mostly that, Anthony wants to play for the Knicks. He basically told the Nets and Nuggets that, which finally ended months of rumors which, now we know, had no real basis. The Knicks can step forward with a trade offer, though I also have heard Anthony doesn’t want to go to the Knicks if a trade involves them giving up too many good players and making it more difficult for them to compete. The Knicks have talked openly about acquiring draft picks, presumably to send on to the Nuggets in a trade. Though it won’t be easy to get good enough picks that would make a difference to the Nuggets. Likewise, while the Bulls have their own first round pick, since it will be in the 20s it’s not particularly attractive. 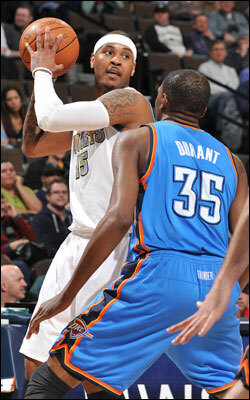 If I were the Nuggets I would keep Anthony and make a playoff run. If they were to say that, things would settle down with their team and they could get in good position and maybe even go a couple of rounds. Playoff games could be worth close to a $1 million per game in revenue. Why not go for that and then clear your roster with contracts for Kenyon Martin and J.R. Smith expiring? And with a big buyout available for Chauncey Billups, the Nuggets could have more cap room than anyone and depending on how the new labor agreement looks there could be teams shedding contracts and the Nuggets could pick up players they want and draft picks. But, at least for now, the Nuggets seem intent on getting something for Anthony after seeing what occurred with James and Bosh. So they could deal with the Knicks and perhaps get some marginal draft picks and a player or two like Landry Fields and/or Wilson Chandler. It’s something. Yes, not much. Then there’s the rental deal. There might be teams willing to take a chance they could persuade Anthony to resign there, like Dallas. The Mavs have a short window with Dirk Nowitzki and Mark Cuban is a gambler. You could see him offering the expiring contract of Caron Butler and maybe a prospect like Roddy Beaubois and taking a shot at a run for the title given the Lakers and Spurs don’t seem unbeatable. The Rockets also have been mentioned as a rental team given they have an excess of draft picks from the trade with the Knicks last season and are desperate for some attention. They’d probably take a shot with nowhere to go with the weak roster they have, though Anthony has told friends he’d never under any circumstances resign with Houston. He wasn’t as definitive about the Mavericks. What about others? Would the 76ers take a shot? Maybe they just want to dump Andre Iguodala and would risk it. Maybe Atlanta with Josh Smith, which has been rumored as the Hawks know they aren’t good enough to win as composed. Heck, maybe Memphis takes a rental knowing they’re losing Zach Randolph anyway and being able to make the playoffs with Anthony is enough. What about the Thunder? No way they’re paying Jeff Green, who’d be a heck of a piece for Denver. Maybe Anthony is a final piece for them in the West this season and then they’ll be way under the cap even if he leaves and can go into free agency. What does Phoenix have to lose? Much of that seems unfeasible, but figure most everyone to try to get back into this now. So could the Bulls get into that picture? Well, they’d never do a rental or risk it. They don’t have enough players and picks to gamble like that. They’d have to do an extend and trade, which would be possible. Anthony has had passing interest in the Bulls, though more so earlier in the season when the Nuggets were asking for Joakim Noah. By signing Noah to an extension, the Bulls effectively eliminated a deal with Noah given the difficulty of matching salaries with Noah’s restrictive contract status as a base year and so called poison pill player. Plus, the Bulls decided not to give up Noah for Anthony. Anthony was said to be insulted the Bulls would chose Noah over him, though he never at the time indicated he’d sign an extension with the Bulls. Obviously, the Bulls would have to trade Luol Deng to match any salary. Denver has no interest in Deng because of his contract. So could the Bulls trade him elsewhere? Heck, would they given how well he’s played and that it would cost them at least another player and perhaps two? It likely would have to be a deal into a trade exception with someone like the Cavs or Raptors. Would they take him for nothing? You figure, but those teams supposedly don’t want long term deals with the new labor deal coming. It could be like a Kirk Hinrich deal where you’d also have to give them draft picks. I’ve heard Cleveland primarily wants draft picks. But then you might not have enough left to deal for Anthony, a trade which would certainly have to include Taj Gibson. So you’ve given up Deng and probably your draft picks and the Charlotte pick from the Tyrus Thomas deal. Although the Bulls have regularly inquired about Anthony, they have not proposed any specific deals, sources say. Are you better off keeping what you have and then this summer going into the market for a shooting guard without having to give up at least Deng, Gibson and draft picks? And that would be if Anthony wants to go to the Bulls, which all indications I’ve gotten are he does not at this time. So this may well play out right to the trading deadline Feb. 24 and you can just hear Richard Hamilton and the Pistons screaming as Hamilton was supposed to be part of that deal along with Billups.